Our First Annual Chili Cook Off was a success! ​After tabulating all the votes for the wide range of chilis (that were anonymously numbered so no cheating!) the winner was our very own June Stevens- chef and baker extraordinaire! 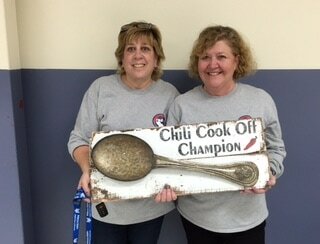 Her white chicken chili won her the coveted Chili Cook Off Spoon. She has generously shared her recipe if you want to make it at home. Saute the chicken breast in a little oil and butter. I season my chicken with a mixture called Sweet Heat Chipotle Magic, which I got at a craft fair. It’s from Hot Squeeze, an Atlanta Company. Heat the oil and butter in a large saucepan over medium-heat. Slowly cook and stir the onion until tender. Mix in garlic, jalepeno, green chile peppers, cumin, oregano, and cayenne. Continue to cook and stir the mixture until tender, about 3 minutes. Mix in the chicken broth, chicken and white beans. Simmer, stirring occasionally for 20-30 minutes. Stir in cheese until melted. Serve warm.